Two, four or six sychronous and creative soloistic drummers play on powerfully microphoned acoustic drums to selected DeepHouse, Dubstep and Techno tracks. They are accompanied by a virtuoso and creative Saxophonist. All instruments are connected to the electronic brain firing up LED visuals and light. The visuals instantly interpret both, the DJ track and, more sparkly, every note played by the drummers or the saxophone. Visibly mounted on every single instrument are LED matrix screens, so what you hear is what you see. The artistic concept, the technology and the musical ideas are provided by the team AudioVisualMusic.de. This team already provided international light and audio installations for the Biennale in Venice 2016 and museums and art gallerys in Switzerland and Germany in coopration with international artists of the music scene and the art scene. 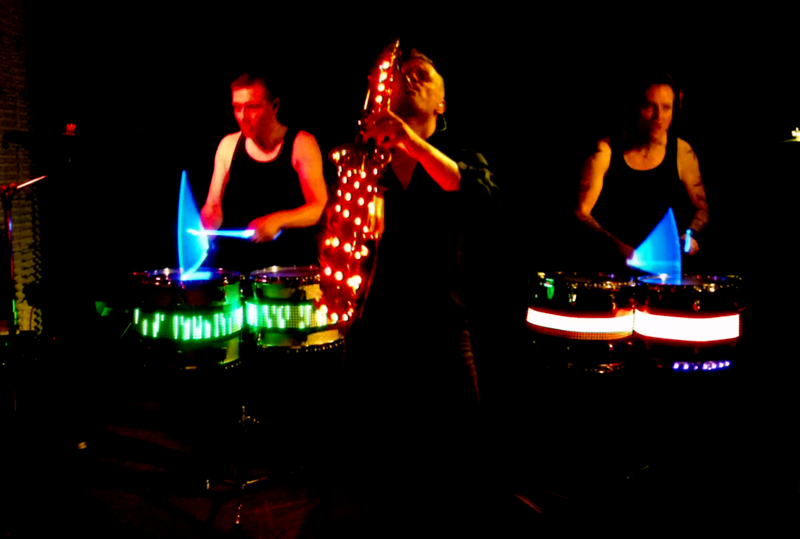 Smash-LED-Drums + Sax, a stunning audiovisual performance.